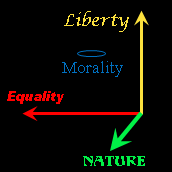 For quite some time on the main site I had a logo which was labeled “liberty, equality, nature.” Meanwhile, the “books” were either red for equality, green for nature, or blue for morality. I had a mismatch. Morality belonged in the logo, and maybe I needed to add some pure liberty books — though my original plan was to relate all other values to liberty. One obvious new color for liberty is gold vs. the light blue I had in the old logo. Gold is the color used for the Libertarian Party, and I hadn’t used it yet. The question remained how to add a fourth dimension to the logo. One option was to use grow/shrink as the fourth dimension, taking a cue from Flatland. Next, I needed some liberty books. Greed vs. Freedom is a critique of Ayn Rand’s approach to liberty as much as it is a morality series, so it could be gold instead of blue. And I have started a new manual of libertarian strategy to have another gold series. For those who have followed my other projects over the years, some of he material will seem familiar. 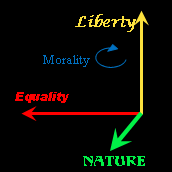 I have written on libertarian strategy at Quiz2d.com and on the Libertarian Reform Caucus site. This go around I am being less party-centric and attempting to be more accomodating to those who won’t follow my approaches. Comments to come will determine my success in this matter. As for the font choices for the chapters on liberty, I wanted to have headings that resembled those in either the U.S. Constitution or the Declaration of Independence. The closest I could find is an Old English font. Not a perfect match, and these documents are mainly cursive, with just some Old English like highlights. What think ye?